Who owns the "black vote" in America? 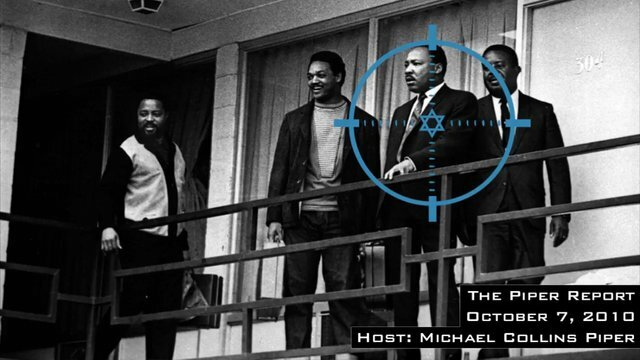 Martin Luther King intended to align his movement with the Palestinians in the 1960's. His assassination also ties in with Israel stealing America's nuclear technology (Numec Coverup) so that the Israelis could use the Samson Option (threat of annihilation of Europe) to blackmail world leaders who would not comply with the demands of the Ashkenazi Jews who conquered Palestine in 1948. During the 2016 presidential election, Donald Trump specifically stated “We all bleed red blood” and included all Americans in his quest to make America great again. Most recently, in Trump’s speech upon his return from his Asian tour, he stated his goal was peace in Palestine. Not Israel, but “Palestine”. The Marxist Jews have always aligned themselves with the very people they brought to North America as slaves so that they could increase their numbers and gain control over the Democrat Party. Under the guise of "sympathy for the down trodden", and using the holohoax lie, the Marxist Jews were instrumental in creating the Welfare State in America. Michael Collins Piper was assassinated for telling the truth. Cardinal Francis Joseph Spellman, archbishop of New York; the Rev. Martin Luther King Jr.; and New York Gov. Nelson Rockefeller at the Sheraton Hotel in New York City in 1962 for the centennial of the Emancipation Proclamation. While much is being made about the new movie Selma’s depiction of the complicated relationship between the Rev. Martin Luther King Jr. and President Lyndon B. Johnson at the summit of the civil rights movement, it was actually King’s friendship with a larger-than-life Republican governor that speaks to our more complicated political past. Looking past it, we not only miss a host of intriguing historical surprises but also underestimate King’s deft leveraging of power on either side of the aisle. Nelson Aldrich Rockefeller (1908-1979), scion of a mighty oil dynasty, was the four-term governor of New York who also served as vice president under President Gerald Ford and did his best to outdo LBJ’s Great Society by way of his own blended liberal-conservative style, which he described as having “a Democrat heart with a Republican head.” Before being shouted down by his own party at the 1964 Republican National Convention in favor of Barry Goldwater’s conservative forces, Rockefeller thought that energetic governance, to save capitalism by softening its sharpest edges and to advance civil rights in the Lincoln tradition, would be his ticket to the White House. Had he been right, we wouldn’t be talking about LBJ and the Voting Rights Act today. Before it was fashionable, Rockefeller, more than any other white political executive in his party and far more than most Democrats, recognized King’s potential to lead the march for justice that would redefine American greatness in a Cold War world. Now, for the first time, we get a more complete sense of his support for King in an impressive new biography by noted presidential historian Richard Norton Smith: On His Own Terms: A Life of Nelson Rockefeller, reflecting 14 years of research that tracks this remarkable man through his flawed but ebullient life. In 1961, when King was still largely unknown outside the South, Rockefeller overruled advisers who were worried about how it would look if he shared the same stage with King and instead hired a film crew to capture King’s oratorical gifts. “If it’s morally the right thing … it’s the politically right thing,” Rockefeller told his team. And as he pressed for an end to discrimination in New York, he took delight in tweaking his Democratic rival in the White House, another legatee of Northeastern wealth, President John F. Kennedy, for being more talk than action. Rockefeller was anything but talk. In fact, Smith reveals, it was Rockefeller’s representative who secretly provided a suitcase of cash to King’s attorney Clarence Jones in the basement of the Chase Manhattan Bank as bail money for those arrested in the Children’s March in Birmingham, Ala., in May 1963. “If we had one or two governors in the Deep South like Nelson Rockefeller,” King observed, “many of our problems could be readily solved” (quoted in the entry on Rockefeller in the online King Encyclopedia, out of Stanford University). Again, two years later, as LBJ, fresh off his landslide election, agonized over King’s planned second march in Selma, Rockefeller, even after his humiliating defeat to Goldwater (who had voted against the 1964 Civil Rights Act), answered King’s call for national reinforcements by sending his own cousin, Alexander Aldrich, to join the throngs hoping to return to the Edmund Pettus Bridge. 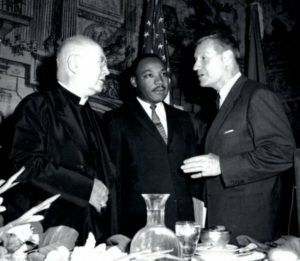 And later in 1965, Rockefeller flew to Atlanta to speak at Ebenezer Baptist Church and made a $25,000 donation to King’s Gandhi Society for Human Rights. Rockefeller, Smith details, even “imported Italian craftsmen to restore the sanctuary’s stained-glass windows.” Even if King found it impossible to endorse Rockefeller’s run at the presidency, given his party’s rightward turn and LBJ’s record of delivering, Rockefeller wasn’t shy about inviting the reverend and his family to his posh Fifth Avenue digs in New York City as an escape from the looming pressures of travel and threats of death. We now know from Smith that when death did come for King in April 1968, Rockefeller was so appalled that he immediately ordered his state’s flags lowered and sent a trio of emissaries to Atlanta to help the King family plan and pay for Martin’s funeral. According to Smith, one of Rockefeller’s key aides on the scene, Joe Canzeri, even “picked out the casket, located and repaired an ancient farm wagon for the procession to the cemetery, found mules to pull it—and took the King children to see their father lying in repose at the Spelman Chapel (named for the family of Nelson’s grandmother Laura Spelman). And when Mrs. King needed a plane to complete her husband’s march in Memphis, Tenn., it was there. At the time the story went unreported, Smith writes, because, as Rockefeller told Canzeri, “We don’t want to make any political hay out of the misfortune of the family.” What Rockefeller did say in his public statement was this: “The true memorial to Martin Luther King cannot be made of stone. … It must be made of action.” For Rockefeller, this meant ramming through legislation to create New York’s Urban Development Corp. to rebuild the state’s blighted cities, however controversial and exacting the political price. Rockefeller never did realize his dream of becoming the Republican Party’s standard-bearer, even after making one more frantic run at reclaiming it for civil rights following the assassination of Robert Kennedy in June 1968. Worse, he had to suffer being called the GOP’s enemy as it seized its own dream under Richard Nixon of becoming the party of the South and, increasingly, of white voters (62 percent of whom voted for Republican candidates in the last House elections). Meanwhile, African-American voters completed their own great migration to the Democratic Party that had begun with Franklin D. Roosevelt, accelerated with Johnson and culminated in their 90-plus-percent support for President Barack Obama in the last presidential race. This is not meant to overstate Rockefeller’s case. Indeed, over time, Rockefeller himself became associated, notoriously so, with decisions that exacerbated racial tensions in the fallout from the civil rights movement. There was his support for the war in Vietnam; his deafness to calls for black self-determination (as opposed to housing projects built and neighborhoods cleared by orders from the top); his reckless handling of the prison uprising at Attica; and, most damaging, his crusade for stiff, mandatory sentencing for offenders in the wider war on drugs that would erase so many futures when crack cocaine hit the streets and the Reagan revolution arrived. But one cannot help wondering whether King, if he had lived instead of being robbed of his future, would have saved Rockefeller from himself and the misguided policies, however wonkish or well-meaning, that destroyed lives and clouded his record. Fifty years ago Rockefeller, despite his many flaws, presciently warned the GOP to keep its tent wide by keeping out “preachers of racism or extremists of reaction.” While we can debate the legacy of what followed, it was clear which preacher he preferred. Kevin M. Burke, Ph.D., is director of research at the Hutchins Center for African and African American Research at Harvard University. Editor's note: It's very possible that MLK was trained by the CIA at Stanford University. MUST SEE VIDEO: Michael King Jr. was a Phony American Hating Communist Sexual Degenerate. Piper defended alternative medicine, animal rights and the past activities of Liberty Lobby and Willis Carto. He was featured as a guest on James Edwards' radio show, The Political Cesspool, which has also been accused of promoting anti-Semitism. Piper was invited to Iran to speak at the International Conference On Review of the Holocaust: Global Vision 2006, and personally met with Iranian president Mahmoud Ahmadinejad, a Holocaust denier, during his New York City visit to address United Nations General Assembly. Piper's body was discovered on May 30 or May 31, 2015 at the Budget Saver Motel in Coeur d'Alene, Idaho. The deputy coroner's report stated that the cause of death was a "probable Myocardial Infarction, Ischemic Cardiomyopathy and Coronary Artery Disease", and listed diabetes as another significant condition. The report indicated that toxicology results were consistent with her findings and that no autopsy was conducted. The article gave Piper's age as 54.